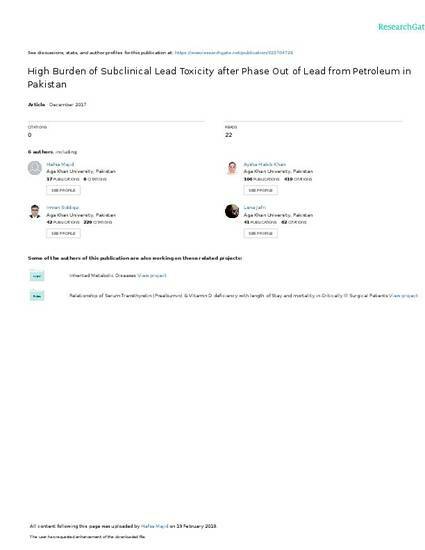 To evaluate the frequency of subclinical lead toxicity. Department of Pathology and Laboratory Medicine, The Aga Khan University Hospital, Karachi, from January 2011 to December 2014. Analysis of laboratory data for blood lead levels (BLL) was performed. Lead was tested by atomic absorption spectrometer. For all subjects, only initial test results were included while the results of repeated testing were excluded. Exemption was sought from institutional ethical review committee. BLL of 2-10 ug/dl and 10-70 ug/dl in children and adults, respectively were taken as subclinical lead toxicity. Amongst the total number of subjects tested (n=524), 26.5% (n=139) were children (<16 years) while rest were adults. Overall median BLLs was 6.4 ug/dl (20.9-3.1). The median BLL was 4 ug/dl (6.7-2.6) in children and 8.3 ug/dl (27.9-3.4) in adults, respectively. The BLL increased with age; higher levels were observed in age range 21-30 years of subjects [median lead level 16.9 ug/dl (36.1-4)] and lower level [4.2 ug/dl (6.8-2.6)] in children with <10 years of age. Only 16% (n=22) children had desirable lead levels while most had either subclinical (76%, n=106) or toxic lead levels (8%, n=11). In adults, (55%, n=212) subjects had desired lead levels, and 40% (n=154) and 4.99% (n=19) had subclinical and toxic lead levels. Presence of subclinical lead poisoning even after phasing out of lead petroleum in Pakistanis is alarming, especially in children. A national population-based study to determine the lead status and targeted intervention to identify potential sources is need of the time.